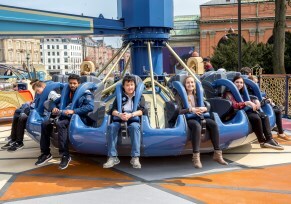 Huss Park Attractions GmbH has proudly announced the completion and opening of the world’s first Condor 2GH ride at the famous Tivoli Gardens amusement park in Copenhagen, Denmark. 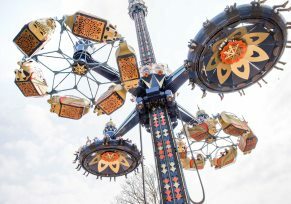 The first example of the attraction from the German amusement ride manufacturer has been added to the Oriental area of the park. The delivery, installation and commissioning of the project were once again completed by the company on time, all within the specified time periods. Notable for a number of unique design elements, the new attraction, called Fatamorgana, represents an outstanding creative performance by the HUSS® engineering and project management teams in conjunction with Tivoli’s own design office. Intricately themed and decorated with oriental floral and graphic ornamentation to complement the surrounding area, the designs used incorporate bright oriental colouring with gold highlights to set an amazing scene for guests. The Condor 2GH offers unique and very different ride experiences, with a choice of soft thrill ride and panoramic ride at a tower height of 45m. Passengers travel in either gilded winged lions and winged oryx antelopes, flying on illuminated magic carpets, or for a more thrilling, faster experience can choose one of two, 14-seat circular gondolas, with seats facing outwards and legs dangling free. The combination of both the double seater gondolas and the suspended seats on one attraction at the same time creates the new hybrid seating concept by the German ride manufacturer. The spectacular illumination concept, provided by thousands of LED lights throughout the new attraction, perfectly complements the theming and decoration and creates a stunning visual impression. Since its opening the new ride has received hugely positive feedback from riders and other park guests. The Condor 2GH provides unique ride experiences, offering a choice of soft thrill ride and panoramic ride. Up to 900 people per hour will be able to enjoy the attraction. For a more thrilling experience, guests can ride in one of two 14-seater, circular gondolas, facing outwards with the legs dangling free.